In the UK, you need really early peppers. After searching for many years, we are pleased to offer a range that are very quick to fruit, taste great,and do well in our dodgy summers. at the very latest to have any chance of a decent crop. Once germinated, the seedlings will grow on at lower temperatures. We find we can grow excellent plants when our propagator is full by starting seed on the counter next to our Rayburn & then growing on in a sunny windowsill. 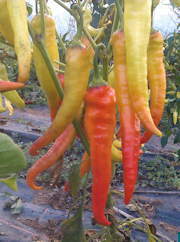 We discovered this lovely sweet pepper in 2010; the pants are compact and it looks great covered in the ripening yellow-orange fruit. It is unusual to find an early-fruiting variety of this shape pepper, but Semaroh does well in the UK: the plants are early and productive, with lots of foot-long pointy sweet peppers. We have just got lots of fresh seed in stock and we like to offer a bargain pack when we can, so are offering it at a special price this year. 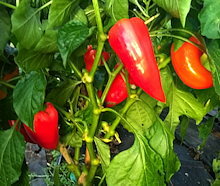 NOTE: We also have its evil twin, a very similar but outrageously hot pepper called Ohnivec, over on the chillies page. This is a quick-growing giant bell pepper that grows to 4" wide by 6" long - or more! 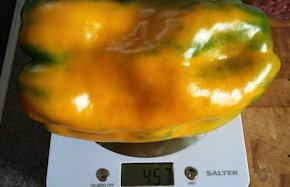 It's quite early, and the huge peppers turn bright sunshine yellow as they ripen. It has a particularly good flavour when it gets to the yellow stage. Really long peppers - perfect for stuffing, or just munching on. Here is an great old favourite which we were pleased to offer again after a long absence from the catalogue. We last had seed of this in 2004, and it was immensely popular at the time. Lipstick is an ultra-early sweet pepper bred specifically for northern market gardeners and it does very well in the UK. We have now reselected the original strain for bigger meatier peppers, and that is the seed we are now offering you - it's really good! The small plants quickly set lots of 4" pointy green fruit which ripen to a truly lipstick-red colour. Pointy, good thick flesh, early to fruit. This is an amazing, chocolate-brown sweet bell pepper. The only early chocolate pepper there is, it was bred by the late Prof. Elwyn Meader specifically for home gardeners in cooler climates. The incredible colour comes from a purple skin overlaying a sweet brick-red flesh. It looks amazing sliced in salads, but is also excellent cooked. We love it roasted, which really brings out the delicious sweet flavour. Famous for its earliness and sweetness even in cool climates - the chocolate-coloured skin helps it absorb whatever sunlight there is available. We released this in 2009, and we think it is still the best-flavoured, meatiest pepper that we've got. It is from the Antonov family farm in central Bulgaria where it has been grown for generations. The original seed was given to us by Mitko Antonov - from his seed we selected several lines, and from those we have bred this new variety. It's great - the plants are very quickly covered in medium-sized juicy red bells, with very thick crisp flesh, and a particularly satisfying flavour. They are also excellent used green earlier in the season. Released by us as Open Source Seed for the benefit of all. You have the freedom to use these public domain seeds in any way you choose. In return, you pledge not to restrict others' use of these seeds or their derivatives by registration, licencing, patents or other means, and to include this pledge with any transfer of these seeds or their derivatives. If you pass the seed on, please tell people about its open-source status. This rare variety does really well in this country. It's a truly vigorous orange pepper, really early & so good for cooler areas. It was bred by Alex Heklar in 1989, and we think it is the best orange bell pepper for the UK climate. Apart from earliness and heavy setting, the best thing about this is the particularly sweet flesh. The plants grow very quickly, and make lots of large orange peppers which are nice and sweet both cooked and raw. They fry up nicely to a rich sweet sauce for pasta. The fruits really are large and the plants make several in each clump. 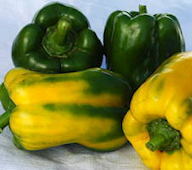 Our best cold-summer-adapted, big green bell pepper. This thick-fleshed pepper was bred specifically for home gardeners in short-summer areas. The plants grow very fast and soon set a good crop of large green bells. If you leave them, they will of course turn red later, but they are excellent eaten green. This is the sweet type of what is known as a "Hungarian Wax" pepper. 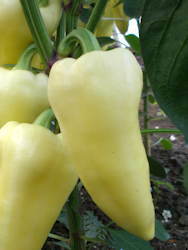 It is an early variety, making lots of pale yellow-white sweet peppers. The beautiful fruit have a wide, pointed cone shape and are extremely tasty. Very productive (you may need to stake the plants or the weight of fruit can pull them over!) and good fresh in salads or used in cooked dishes, with a distinctive flavour. 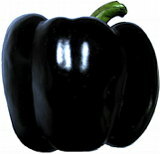 This variety is great - very early, and it makes sweet blocky bells that really are such a deep purple they appear almost black. When you slice them open there's an amazing contrast with the bright green flesh inside. Delicious both raw and cooked, ideal for pepper sticks served with dips. Great both cooked or raw , truly purple, and early. This is another incredibly early red pepper, with pointy red fruit and spirally curled-up tips like a turkish slipper. It has really good thick, crunchy sweet flesh, & we like it best raw rather than cooked. It was given to us by a Bulgarian student many years ago. It has always done very well in our trials, coming ready in the very first group of peppers, and we're pleased to have quite a few packets available for you to try, grown for us by the folks at Brithdir Mawr in Wales. We're really pleased with this amazing big early yellow pepper from Bulgaria. 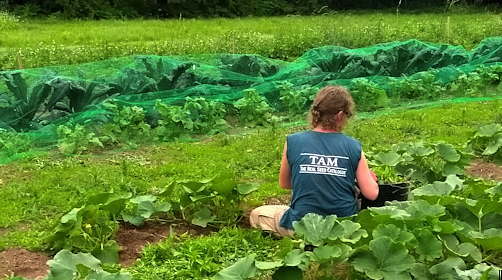 It was one of the best in our trials , and this summer produced buckets and buckets of peppers - so many we had to keep adding stakes to hold the plants up. The fruits are big and glowing. They start out a very pale white-yellow, and were bred to be delicious raw or cooked at this stage. They later ripen a deep sweet red if you can resist the urge to munch them before that! Bred for flavour, thay have a particularly good 'sweet pepper' taste, and we have found that if you freeze the glut , it has an amazing 'roasted pepper' flavour when defrosted. A fantastic early pepper for the UK. A hot pepper without the heat, from pepper expert Jeff Nekola. 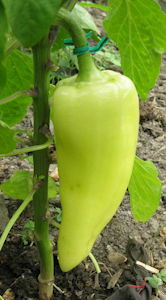 Ají are a different species: Capsicum baccatum. This is one of the largest-fruited of our Ají peppers, the beautiful fruit are shiny, almost waxy in appearance and glow a deep red when ripe. Incredibly productive, & a favourite every year, we like it grilled and served with olive oil. Without the heat, subtle undertones of Ají flavour come out, with distinct smokey tastes being the most obvious. One of the easier of our unusual / rare peppers to grow, though you do need a polytunnel or greenhouse. If you want a challenge - it can be overwintered if you keep it frost-free - we did have one plant that made it to 3 years old and in its last year it made over 270 peppers! We have had a couple of reports last year of stressed plants making some heat near the seeds. But in normal conditions this should be classed as a sweet pepper. Very rare, pretty easy to grow. Gently smokey Aji. Not hot - mostly: the occasional pepper is warm, especially towards the end of the season, or with plants in their second or third year. PS: The name of this traditional variety translates roughly as 'Amputated Fingers' , which is fair enough given the shape and colour, but seems to be in dubious taste! or keep the insects out. 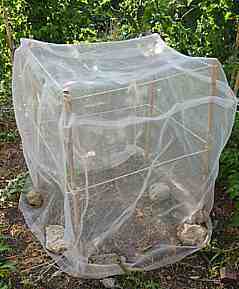 Either use a net cage, or even easier, bag individual flowers. You really do need to do this! Any crosses between the sweet peppers and chillies will be hot the first year, then all mixed up thereafter . . . However, if the plants were isolated, the seed-saving bit is really pretty easy. cut it open, and flick out the seeds. Leave them to air dry, and then dry them properly so they don't die in storage. That's it! Basic seed-saving instructions are included with your seeds, so you can do this yourself. in the box titled 'SeedSaving', with sheets on drying and storing your seed too. And of course, seed-saving is only possible because these are all real, non-hybrid varieties.